Yesterday at the Santa Fe Farmers’ Market I was lucky to spot the last bag of blue cornmeal at one of the vendor’s stands and this morning I made this blue corn cornbread. I had not planned to post this here but I had someone Tweet me (my Twitter name is SmartLifeways if you would like to follow me), to post a photo of my fresh cornbread so I decided that I should share it here. Corn is one of the most commonly grown genetically modified crops so it is really important to support farmers who are growing the real thing. In the film King Corn one of the farmers comments that he cannot even eat his own corn-how is that for irony! Today most of the corn that is grown is not even meant for human consumption, and we have huge tax subsidies to support this. The majority of corn grown in the U.S. is used to feed animals in the industrial ‘production’ of cheap meat or is made into high fructose corn syrup or other corn based sweeteners, which have no health benefits or food value. This is a terribly inefficient use of the land, supports cheap, unhealthy food and is making Americans sick by consuming animals that must be pumped with antibiotics because the grain they are fed makes them sick and the corn sweeteners are contributing to obesity and diabetes. Enough about the problem….the solution is to buy Organic or Pesticide Free corn that is not genetically modified. We need to preserve the integrity of our food supply and this is one of the best ways to do this. If you shop at a farmers’ market and they don’t indicate their produce is organic be sure to ask if it is pesticide free and be sure they are not using GE-genetically engineered, seed. When you go to your local market tell the manager that you want GMO/GE (genetically modified organism) free corn, and other products too. We have the power to change what is in the stores by using our dollars to speak out. Many natural food stores often carry commercial produce so read what you are buying and be sure that you are getting what you want! Buying unusual varieties of fruits and vegetables helps to preserve bio-diversty, which is exceedingly important as Big-Ag creates miles and miles of mono-crops. When all of the crops are the same variety, and in the case of GE seed-genetically identical, they are more vulnerable to changes in the weather and pests. Some heirloom varieties of fruits and vegetable have been planted for hundreds of years and they offer a range of flavors, and survival skills. And this brings us back to the beautiful blue corn meal that I found yesterday. I am not sure how long this variety has been planted here but I am sure that it is not genetically modified and has been grown in this area a lot longer than I have been around. I am grateful to be able to support the local farmers and be a part of a community where what we eat and how we treat the land, and each other, matters. When we come down to it, what could be more important? Without healthy food and fertile land to grow it we are doomed. 1 egg-organic of course. please don’t support industrial farm practices especially when it comes to animals. 1 cup milk-yes, also organic….think of the cows. Mix the dry ingredients and toss with a fork to combine. In another bowl whisk the egg and add the oil and milk, whisk to combine. Heat a skillet or metal pie plate in the oven. Once it is hot, oil it with a little bit of oil-I used olive oil. Return it to the oven while mixing the batter. Add the wet ingredients to the dry and mix just to combine. Pour into hot skillet, or pie plate, and bake about 15 minutes. Top will brown slightly and shrink a bit from the sides of the pan. A knife inserted will come out clean. I started my day with this and eggs, and later I will have more with a bowl of chard & spinach soup. If you make this at home don’t plan on it lasting too long-it is really good and goes with just about anything. The vendor who had this marvelous treat is Talon de Gato Farm. The corn is grown in San Jon by another farmer and milled weekly at Talon de Gato. They are in Apodaca, New Mexico which I think is just next to Dixon. I hope to visit them soon and tell you more about them. 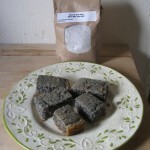 If you are lucky enough to be in Santa Fe look for them at the Saturday Farmers’ Market and pick up some blue cornmeal. Excellent writing. I have really enjoyed reading these post. In fact I would love if you would contribute to our newsletter. Please consider it. I would love to have your message/wisdom shared with my customers. About corn…sad truth is the hope for keeping heirloom var. clean from GMO is about nill. Why…HUGE problem with corn pollen traveling in the air. We are on the West Coast and it is not uncommon for pollution control folks monitoring samples to find GMO pollen from China. It literally drops from the sky. What is a farmer to do?